Everyone plays slots for the extreme rush and Extreme Heat is a lot that brings you a rush that will have you sweating out as you land a combination of awesome wins. This is a slot that combines modern day reels with the symbols of old such as bars and 7s, but adding a little more heat to the action. Bet 30 paylines and get 15 coins down per lone worth $0.01 to $0.25 per line. Roll in a flurry of multipliers, free spins, bonus symbols for access to the Extreme Heat free spins round, scatter symbols, and finally wild symbols that also account for the symbol jackpot combination. This is an excitingly themed game with some fast and furious red hot action on the reels! There is also an amazing add-on to this slot with re-spins allowed after every spin for a small cost calculated after every spin. In addition, the free spins round offers a jackpot of up to 440,000 coins! 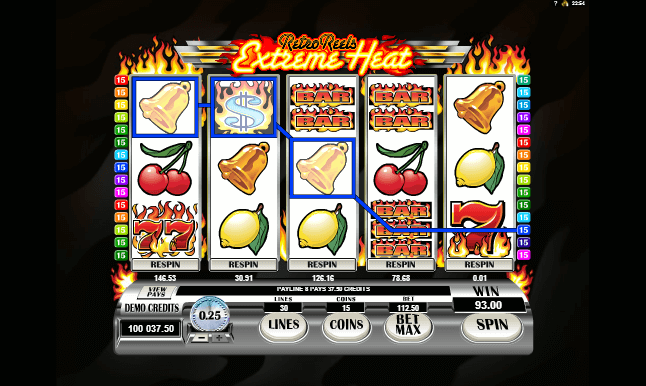 Flaming dollars are the jackpot symbol on this slot as well as the wild symbol; while, the rest of the themed symbols are based around the golden oldies of the slot word such as lucky 7s and bars. Roll in 3, 4 or 5 triple, double or normal flaming 7 symbols for a x50, x250 or x500 multiplier of the number of coins on the pay-line. Line up matching 7 symbols, so 3 or more triple flaming 7s or 3 or more double flaming 7s for the win to count; however, should you hit a mix of these 3 symbols on a payline, then you will be in for prize anyway. 3 or more of any of the flaming 7 symbols mixed on the reels gives you x5, x20 or x50 multipliers on the line bet for 3, 4 or 5. You can also roll in triple, double or single bar symbols for an equally as stimulating x25, x150 or x350 multiplier of your line bet. Plus, as with the flaming 7s, you’ll get x5, x20 or x50 multiplier of your line bet for mixing the bar symbols on a payline. You’ll also come across the Liberty Bell, Lemons and cherries. And just to make things nice an easy on the reels, there is a scatter that pays multipliers of not the bet on the payline, but instead multiplies the entire bet placed across all paylines. 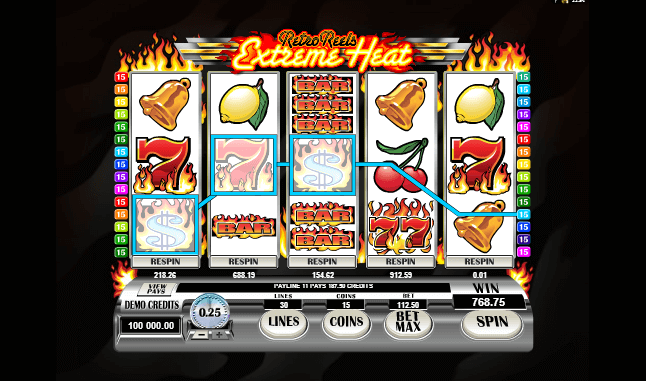 What really makes the Extreme Heat slot unique is its Re-spin feature. After every spin there is option to hold the other reels and re-spin a single reel at a small cost that will have been calculated after each spin you make. Furthermore, you have a free spins round that comes after the scatters pay out a handsome multiplier of your spin bet. You get paid for 2, 3, 4 or 5 scatters, but you will only go into the free spins round with 3 or more scatters on the reels. To land a symbol combination the first symbol must always start on reel 1. From here, the symbols must be on adjacent reels running from reel 1 across reels, 2, 3, 4 then 5. You can connect 2 of a kind symbols with the ‘Flaming Dollar’ on reels 1 and 2. All the other symbols you can make 3, 4 or 5 of a kind. For example, a 3 of a kind symbol combo will run across reels 1, 2 and 3 and a 4 of a kind across 1, 2, 3 and 4. After every spin at the bottom of the reels you can choose to respin 1 reel. The other 4 reels will hold; while this reels respins. The cost of selecting that reel to respin is calculated after each spin. The more scatters potential wining symbols or wilds on each reel, the higher the cost of the respin. A word of warning before you do take advantage of this feature. If you have already been paid out for a win, and you choose to re-spin, the win will not pay out again or this would be too easy! You’ll be paid x1, x5, x10 or x50 your spin bet for landing 2, 3, 4 or 5 scatters. This is the Free Spins Bonus scatter symbol. It can land anywhere in view on the reels without being held to a pay line or having to start the combination on reel 1, moreover, the scatter combination does not have to be on adjacent reels. To get into the free spins round, all you need is 3, 4 or 5 bonus free spins scatter symbols anywhere at all on the reels. This is the same as the scatter combination rules and so you will be paid a multiplier of x5, x10 or x50 your spin bet for 3, 4 or 5 bonus free spins symbols, and then you will enter the free spins round. There are 440,000 coins up for grabs here, and this comes courtesy of 10, 15 or 20 free spins in exchange for 3, 4 or 5 of the scatter symbols. This is also the highest paying symbol combination on the game. Not only does it pay out the jackpot of 10,000 coins when you land 5 across the reels, it also pays out for landing 2, 3, 4 or 5 symbols. As a wild, this symbol acts as the game’s wild card. It can substitute for any of the other symbols in the game by acting as one of the other symbols filling in the combination to create a win, or it adds on to the end of other symbol combinations increasing the win. You can bet as low as 1 line per spin or bet all 30 paylines available. You have to put a minimum of 1 coin per activated line on the slot. Coins are worth $0.01, $0.02, $0.05, $0.10, $0.20, $0.25 and $0.50 each and you can place up to 15 coins per line. When you want to increase the number of coins per line, you must remember that every line you select must have an equal number of coins on each line. You cannot bet 5 coins on line 1 and then 3 coins on line 2 – therefore, you have to bet 5 coins all lines or bet 3 coins on all lines. If you bet all 30 lines, this is sequence of coins you would need to bet. Each coin can be wagers using different denominations. The minimum coin bet is $0.01, then goes up to $0.02, $0.05, $0.10, $0.20 and $0.25. The maximum coin bet is then $0.50. The minimum cash bet is 1 coin = $0.01 on 1 line and the maximum cash bet is 450 coins multiplied by 450 coins giving you a maximum spin of $225 per spin, which is a little crazy! For the high rollers, this really is a slot that can pump out a lot of cash.